I love brown drip. I don't know why. It's not elegant, dainty or colorful. I guess it just reminds me of a time long ago when things were simpler. 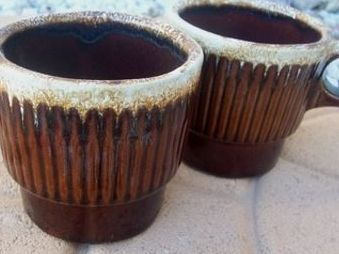 Brown drip is a heavy solid brown pottery with white or cream colored edges that appear to flow down the sides of the piece. It was made by numerous manufacturers such as Hull, McCoy, Monmouth and Pfaltzgraff. As with most collectibles, you have to be careful when purchasing because there are still cheap reproductions being made today. Almost all vintage brown drip is marked. Ovenproof - USA refers to Hull. Monmouth is marked USA usually accompanied by a maple leaf. Some manufacturers, such as McCoy are often easily recognizable by their name. Unmarked pieces can be recognized as vintage from their wear and weight.